Though it originated as a maker of games for Taito, Kaneko was a game company that was quite successful in filling the niche left open early by publishers like Konami and Capcom, which were still shackled to licensing agreements with Nintendo and unable to directly publish on the Genesis. With such an open opportunity on the brand new hardware, Kaneko moved quickly and brought several solid titles to hungry Genesis owners, who were eager to get their hands on such games as Air Buster, DJ Boy, and eventually Chester Cheetah. With its success on the Genesis, Kaneko expanded its operations and also published for Sega’s 16-bit rival TurboGrafx-16, and later the SNES. Many people were involved in making Kaneko the success it was during the Genesis era, and at the forefront of the company’s success was Ellen Fuog, vice president of sales and marketing. With vast experience at such companies as Jaleco, she was pivotal in securing for Kaneko the popular Chester Cheetah license, and brought years of marketing experience to the small company. Though she has since moved on to found Detn8 Games. Recently, Ms. Fuog chatted with Sega-16 about her time with Kaneko. Sega-16: How did you get started at Kaneko? Ellen Fuog: I entered the video game industry in 1979 with the launch of Mattel Intellivision. From there I joined Parker Bros. then over to WICO as Regional Sales Manager and ultimately VP Sales & Marketing. WICO was the primary supplier of both coin-op arcade and consumer video game joysticks and accessories. With the close relationship between both industry divisions, I knew many key personnel at Williams where I met Marty Glazman who became President of Kaneko U.S.A. Because Kaneko crossed both industries, Marty contacted me to head up the consumer products division. Sega-16: The company began developing for the Genesis when few others would, thanks to Nintendo’s iron-clad licensing agreements. Do you know why Kaneko decided to take a chance with Sega over the sure thing that Nintendo represented? Ellen Fuog: Kaneko developed for both the Nintendo and Sega Genesis platforms. As a relatively small publisher at the time, it was cost-effective for us to cross-platform development and publishing. We were the caboose to the hardware engines and willing to follow either lead. Sega-16: How hard was it to market Kaneko’s games for the Genesis? The company wasn’t as well known at the time as others, like Konami and Capcom, and it was publishing on new hardware. What kinds of challenges did you face to make make Kaneko’s games successful? Ellen Fuog: Kaneko was not as well known as others like Konami and Capcom, and it was privately funded by Mr. Kaneko himself. Hence, it was imperative that we look outside the established business model and not solely rely on unlimited development and marketing dollars to bring our products into the market with needed advertising support. Sega-16: How much autonomy did the U.S. division have? Ellen Fuog: Although the U.S. division had autonomy and responsibility for bringing product into the market, it had no voice in those products as developed by the parent company in Japan. This changed with the introduction of Chester Cheetah. With the success of this game, Japan began to understand the differences in gaming culture and license awareness. They also allowed the U.S. division to contract out to European developers for upcoming licensed games (Socks the Cat and Fido Dido) and concentrated on arcade development. 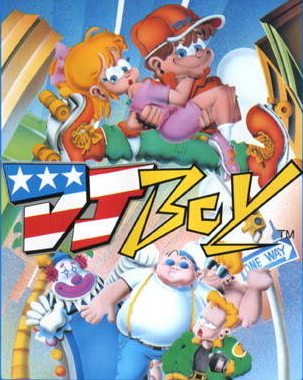 Sega-16: There was some controversy over the characters in DJ Boy, some of which were accused of being racial stereotypes. Was there any major pressure to make changes in the home version because of this, or did only the hardware limitations factor in the game’s development? Ellen Fuog: Again, DJ Boy was created and developed by the parent company in Japan. The U.S. Division had no voice. Any alleged stereotypes were not intentional. Rather, it was a difference in cultural acceptances. Sega-16: Kaneko released games on both the Genesis and the TurboGrafx-16 (Air Buster, for example). Did the company always plan to bring all its games to both consoles? Ellen Fuog: There were initial plans to release Bonk (arcade version) on the TurboGrafx, never on the Genesis platform. If my memory is correct, at the time, the license was only available to us on the one platform. Kaneko USA published on the two major platforms of the time – namely, Nintendo & Sega. Sega-16: Early on, were there ever any plans for Kaneko to develop for the Super NES? Ellen Fuog: Yes. In fact, Kaneko developed and published Power Moves (named Deadly Moves on Genesis) as well as two Chester Cheetah games. Sega-16: The Gals Panic series was pretty racy for the time, and some games eventually did make the jump (albeit in edited form) to consoles. Was there ever any consideration to bring the series to the Genesis, even censored? There are rumors of a Sega CD unreleased prototype floating around. Ellen Fuog: No, Gals Panic was not considered as a console game. First and foremost, the game play was far too limited. Second, the content would never have been approved. In the day, Gals Panic was, indeed, racy for the time — even for arcades. The vast majority of the arcades were placed in truck stops. Sega-16: Kaneko scored a big license with Chester Cheetah, and it appears to have paid off at the time. How did it all come about? Ellen Fuog: I’m glad you asked, because I was always proud of this achievement. While attending the Licensing Show in New York, I came across Chester Cheetah. I was always a fan, and believed that Chester Cheetah was an endearing IP that would cross well into the video game arena. Additionally, at the time, it occurred to me that the demographics of the game player was a square fit with those munching on Cheetos. The U.S. division quickly went to work on story boards and submitted them to Japan. We scored front page status on the premiere magazines of the time, and I created the first cross-merchandising program with the food and video game industries by showcasing our game on thousands of Cheetos bags offering a $5.00 rebate with purchase of both products. It was a huge success, followed by a sequel. Sega-16: Kaneko seems to have been one of those publishers that suffered during the transition from 16 bit to 32 bit game consoles. How much was the company affected by the change? Ellen Fuog: Actually, Kaneko was well positioned for the transition with two games sporting strong licenses: Socks the Cat (President Clinton fame) and Fido Dido that I secured. Both games were in development, and subsequently cancelled. Sega-16: Why did you leave Kaneko? Ellen Fuog: It wasn’t broken, so they tried to fix it. With Kaneko’s success, the company decided to bring in some people with no experience in the industry, which made it top heavy and not very bright. They seemed to feel that whatever success had been accomplished by the consumer division could be done better by uninformed folks with bloated budgets. That didn’t work out so well. I moved on. The rest, as they say, is history. In the meantime, Jeff Hill, who I hired at Kaneko, and I have remained business associates over the years and he is my partner at our new publishing companyDetn8 Games. I continue a strong friendship with Marty Glazman. Our thanks to Ms. Fuog for taking the time for this interview.